Hi everyone, Astrid here, joining you this evening with a post with the current theme Our House. I love my home, - it is my happy place and so I was delighted to create a project related to this theme. Having said that, I chose to take quite a free interpretation and created a journal page incorporating words that express how I feel about my home. 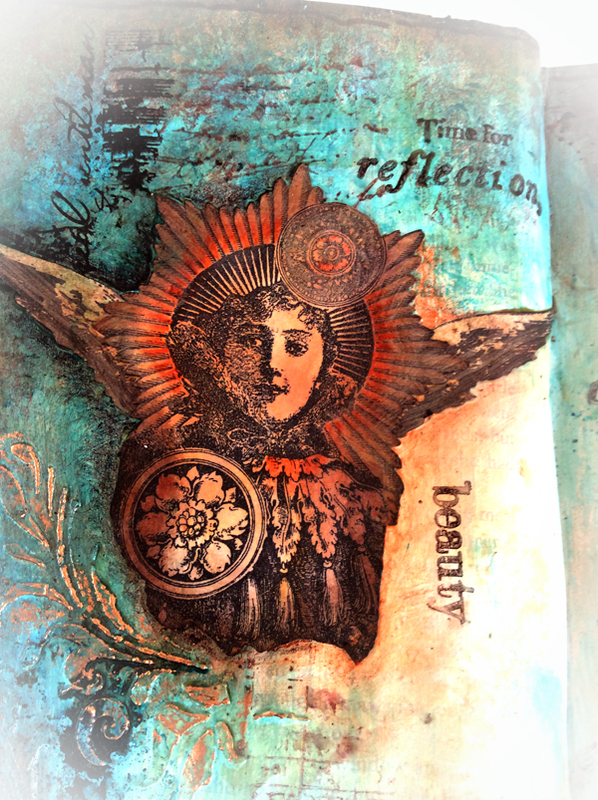 I am a teacher, close to retirement and cannot wait to spend more time creating mixed media art in my craft space. My journal page represents how I feel about my home and that space. 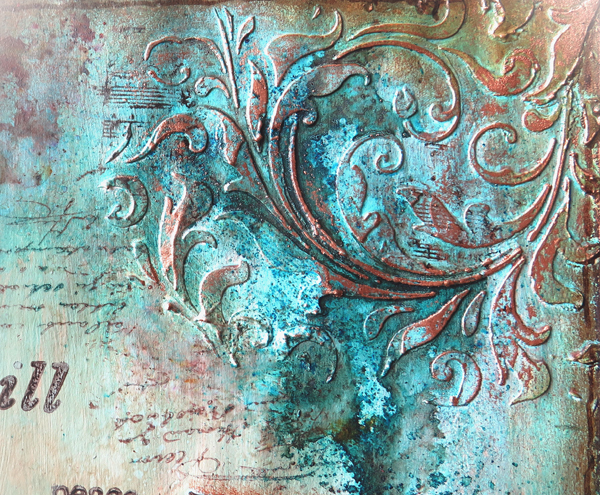 Step One: I started by creating some texture on a double spread in my altered book journal, using Grunge Paste through a Tim Holtz layering stencil, I then added a thin layer of gesso, making sure that some of the text could still be seen. Next I added colour, using the following Fresco paints: Caribbean Sea, Captain Peacock and Chalk. I used a brush as well as a baby-wipe and some crumpled up kitchen roll to achieve textures in different places. Step Two: I love those wonderful turquoise hues, but wanted to add more warmth, so I made a mix of Brown Shed and Baltic Blue, using slightly more of the latter and went around the outer edges of my spread to give it a kind of frame, using the same technique of crumpled tissue to add further textures. I love the purply brown the mix of these two colours makes. Step Three: I have been dying to use the new Infusions, and this was the perfect opportunity to have a play with them, so I picked A Bit Jaded and used it in several places to still add more texture to my background. I also used a bit of Sunset Beach. Step Four: Usually I would at this point start to do some background stamping, but on this occasion I decided to create some focal points first, one for each side. The first is one of the stamps from the wonderful Lynne Perrella Collection LPCO17, this lady represents my muse, as you will see from the final photo. Step Five: I gave her some wings from VID 09. My muse often is in need of wings, and I think they fitted her just perfectly. 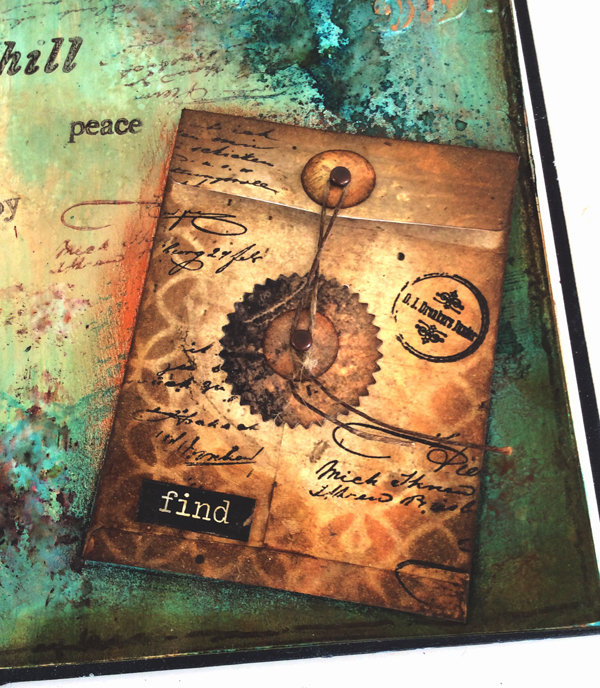 I stamped her in black Versafine and coloured with Vintage Photo and Rusty Hinge Distress inks, adding more definition with a couple of Inktense pencils. For the other side I created a little coin envelope, made with a Tim Holtz die, in its pocket I want to keep notes on things I want to find still for my house. Step Six: I adhered both elements to my spread and then carefully added shadows to blend the elements into the background using Inktense pencils again. Step Seven: Finally I used several other stamps from the VID 09 set to create further interest to my background. I also used some of the words from ESN18 to add sentiments that express what my home means to me, a place to chill, reflect experience peace and joy, and of course most of all create art! I also highlighted some of the raised textures with Treasure Gold Renaissance Gold. Well, I hope you like my journal spread, - I actually made another one, using similar techniques and colours and featuring the main stamp from the ID09 set. If you want to see more details on that one, just visit my blog. Thank you for staying with me and why not create a page of your own to share what your home means to you? Oh and just in case you wondered, - none of the colours I used can actually be found in my home, which is mainly off white in most rooms. I just love the colours I used as they express to me the mood of how I feel about my home. Have a wonderful and creative week! 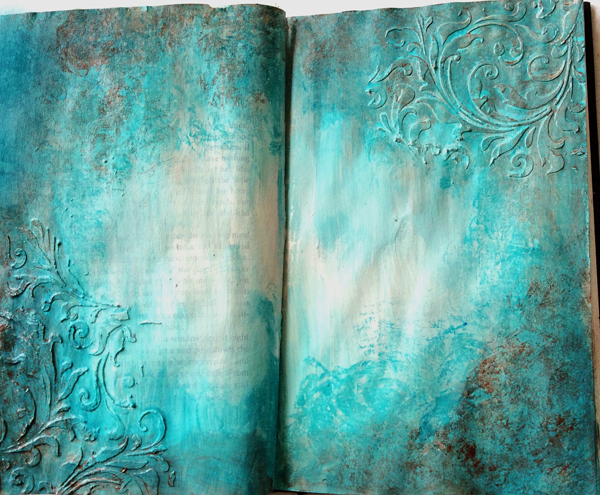 Astrid this is gorgeous - I love your take on the theme, and you created a simply gorgeous page to reflect your home. 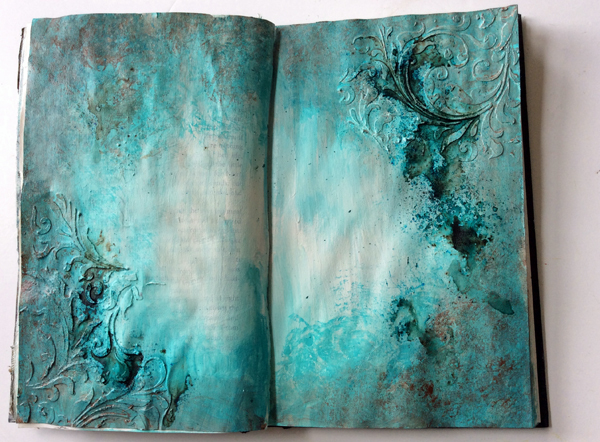 Gorgeous textures and colours for a brilliant journal page. Love it! Oh my gosh Astrid! This may be my favorite spread of yours ever! How unbelievably cool! 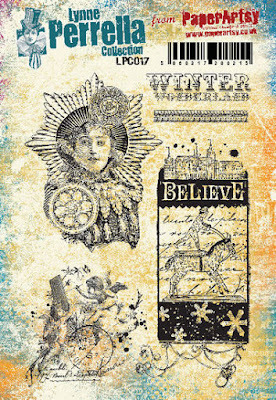 The colors are so intense and draw me in and I love your clever blending of stamps and stamping in different inks. Fantastic take on this theme! 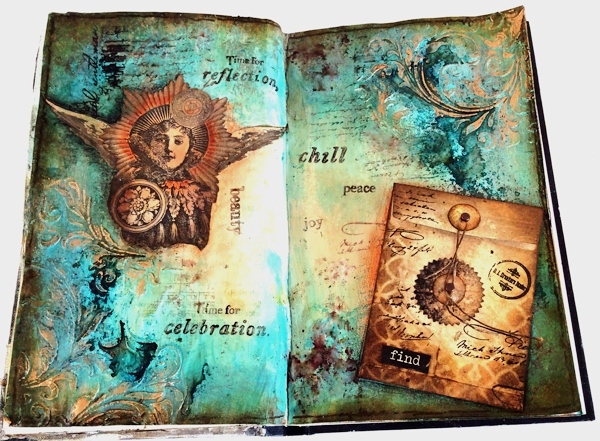 Fantastic journal pages Astrid. That's my favourite colour combo at the moment. You made everything look so rich and warm with so much depth......beautiful! 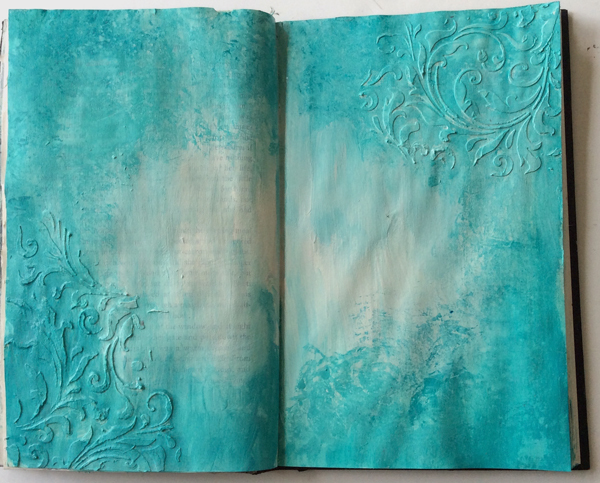 Absolutely gorgeous pages Astrid and lovely to see your work on the blog. The colours and textures and wonderful and brilliant interpretation of the current topic. Astrid - as always - I love your gorgeous pages and thank you for the step process. I really like the paints and stamps you used! Thanks for sharing. Absolutely amazing spread, Astrid. I always love your work and you so inspire me. Absolutely ADORABLE Astrid! I am thrilled about the colours , textures and the compostion! GORGEOUS! What an INCREDIBLE LOVELY representation of how your feel about your home Astrid. Everything you do is done so well and so BEAUTIFULLY that I can only image how SPLENDID your home must be in reality. 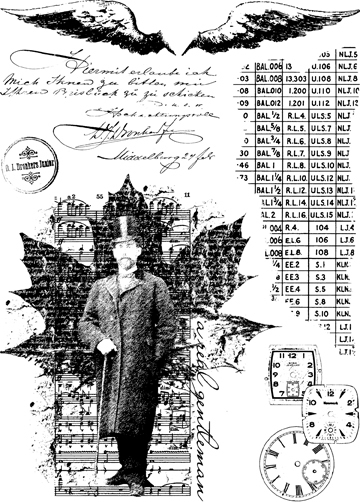 I picture it even more BEAUTIFUL than your journal pages! Xj. A wonderful interpretation of the theme Astrid and such a beautiful way to express your feelings about your home. I love the gorgeous intense colours and your step by step is brilliant!! You have such a unique style and always create the most beautiful things .. love, love, love this one!! Glorious glowing colours, and such a beautiful take on the Houses theme - you can feel the love and inspiration you find in spending time in your home. Love the winged beauty too! Fabulous to see you here. Gorgeous pages! Love the texture and the way Astrid brings her colors to life is fantastic! Beautiful Asdtrid, I always adore your work, but by now I think you know that! Oh my Astrid, this is fabulous, love your amazing blending and colour choices!!! Brilliant!! Stunning! I just love it! Thanks for sharing!